For some, the idea of vintage wallpaper conjures up the image of an unsightly 70’s print being demo-ed out on an HGTV show. 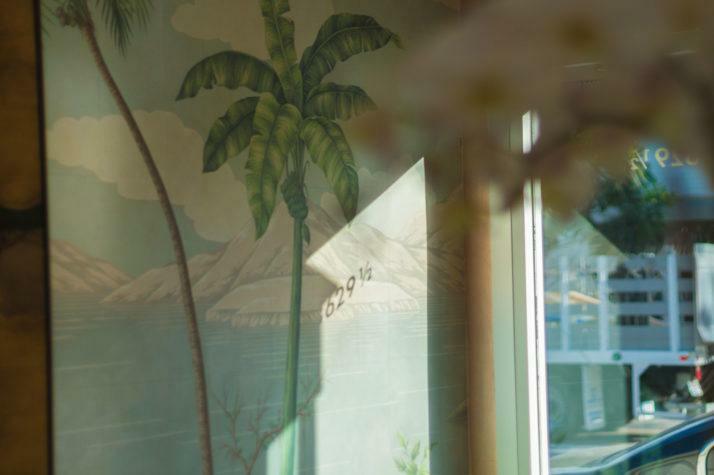 You’ll want to go ahead and shelve that notion, because this 120 year old design studio is not making your grandmother’s wallpaper. 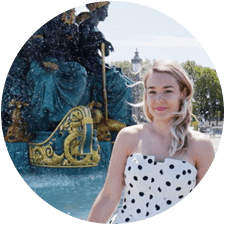 Four generations of the Gracie family have made it their life’s work to marry the past and the present together in a way that is truly extraordinary. In our 2-day shipping obsessed world, their hand-painted wallpapers stand apart, in a niche that seems to have weathered the test of time. 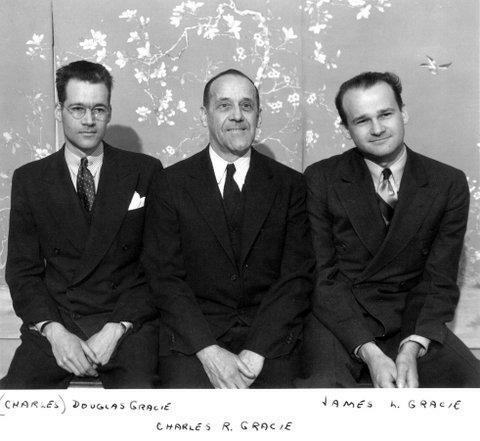 Gracie wallpapers remain highly sought after, and the company’s unique family history certainly contributes to their notoriety in the design world. 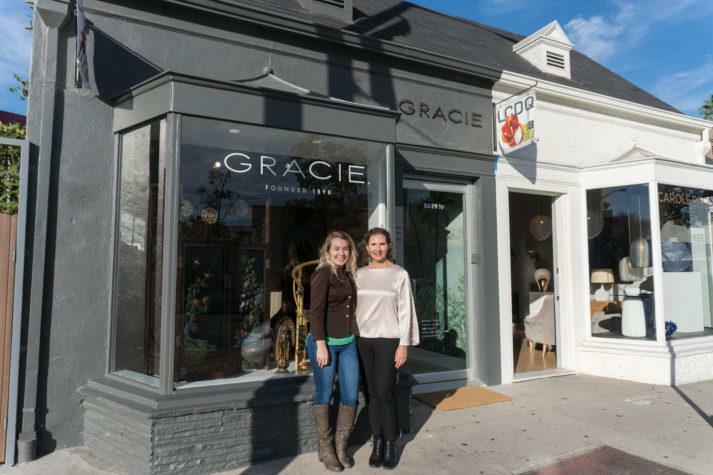 I had the chance to meet with Jennifer Gracie, and her family at the new LA showroom, to discuss the magic behind the Gracie brand. While they’d long been a staple of Chinese decor, it wasn’t until the early 18th century that hand-painted wallpapers ventured out of Asia. The development of trade routes meant that, for the first time, Europeans were experiencing the artisan creations that had been crafted for centuries. 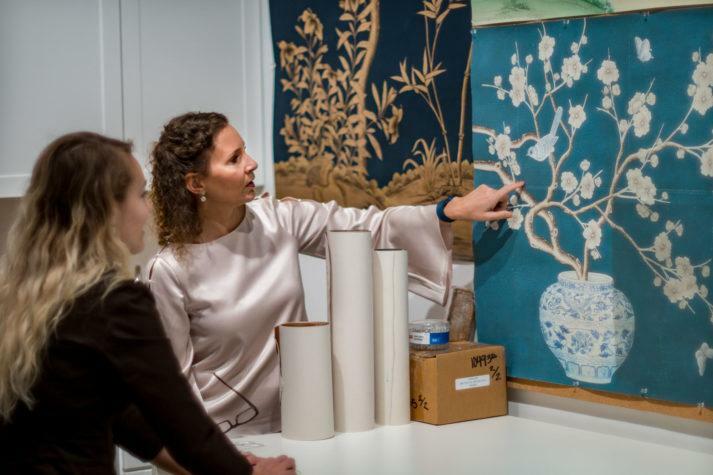 The newly flowing trade was very intriguing to westerners who fell in love with the idyllic representations of flowers, trees, and nature found on “Chinoiserie” (french for “in the Chinese style”) objects. These artisan creations held the fascination of many, who were impressed with the craftsmanship and painstaking attention to detail. Once tea drinking became the “en vogue” way to socialize, Chinese ceramics and textiles became highly sought after commodities. The trend continued on to become a cultural phenomenon, and rose in popularity so much that it eventually it made its way over to the newly formed United States. A hallway of the Gracie Studio showroom, proving you can go bold even in a small space. 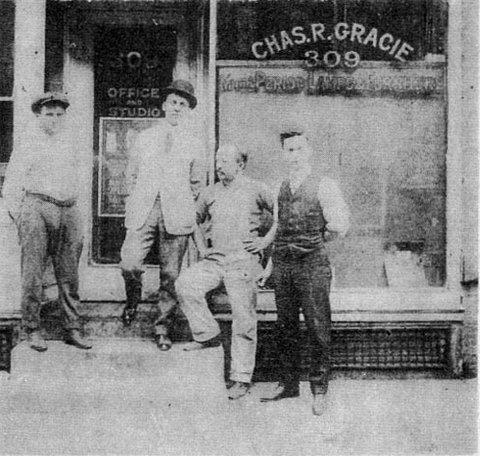 Gracie was founded by Mr. Charles R. Gracie in 1898, in New York City. He began selling custom lamps and unique home furnishings, and by the 1920s, expanded the business to include Chinese and Japanese furniture, screens and porcelain. When a friend in the textile trade presented him with a roll of ornate hand-painted wallpaper, he knew he’d seen something truly exceptional. 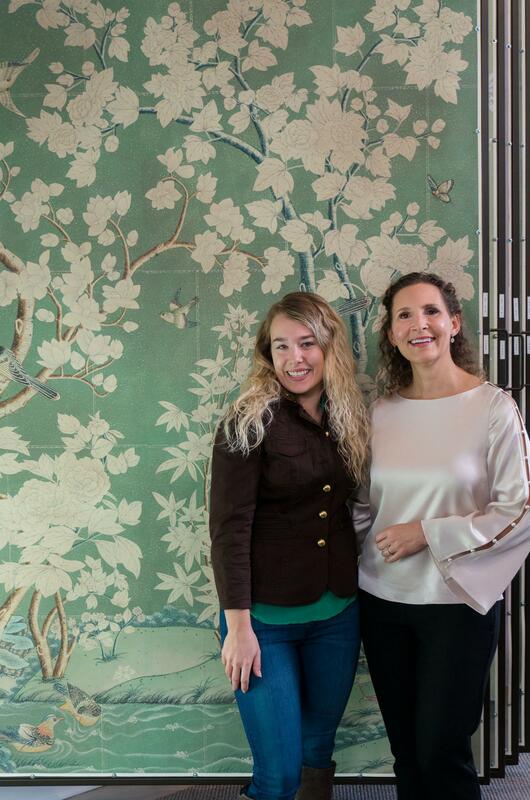 Gracie was the first firm to import these hand-painted wallpapers since their original creation in the 1700s, and really paved the way for their popularity to flourish in the United States. Jennifer Gracie and her brother Michael, are now carrying out their great grandfather’s legacy as the fourth generation leaders of Gracie. 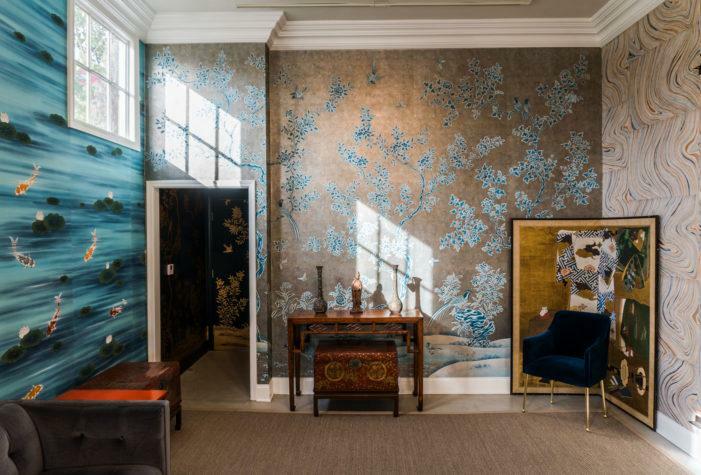 While they still carry an impressive collection of Chinese and Japanese antiques, Gracie is still best known for their remarkable wallpapers. 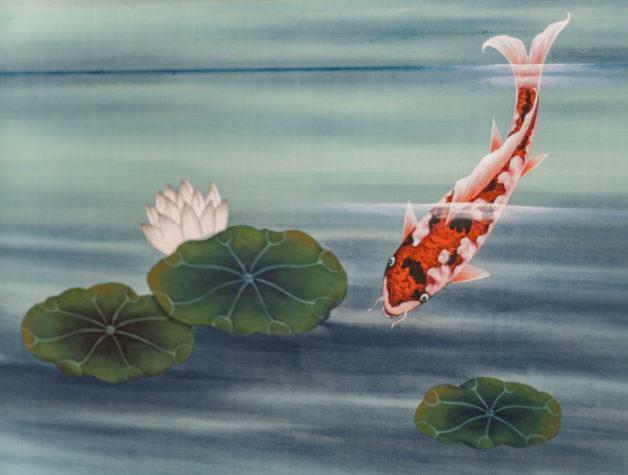 Today, each panel is still hand-painted in China, by same studio the Gracie family has worked with for 50 years. Each newly created paper still carries with it the same motifs, craftsmanship, and air of grandeur that have defined the Gracie brand for the last century. “From the age of two, I knew I wanted to be involved” Jennifer says of her family business. She recalled with warmth the days spent as a child on antiquing trips with her parents, and of the disappointment she’d feel if a sign was posted requesting children wait outside. She knew she wasn’t like those other kids who were probably bribed to come along: Jennifer was in on the mission. 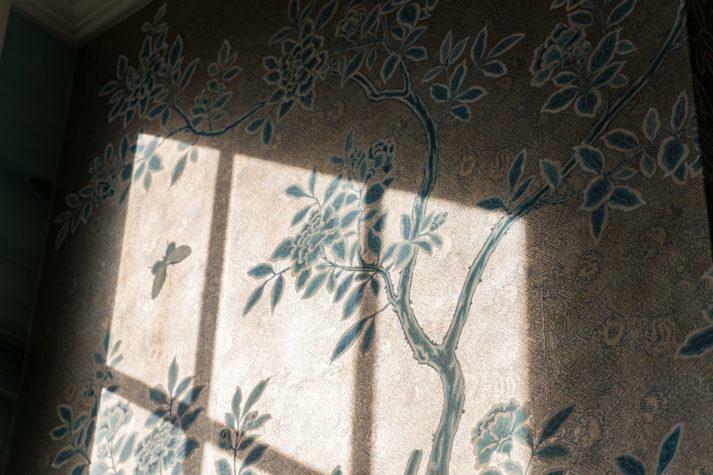 Gracie Wallpaper featuring a Koi fish, inspired by an antique porcelain piece. Now, as a director for the company, Jennifer oversees many aspects of the day-to-day business operations. I was curious to find out what part of the job had become Jennifer’s favorite over the years. “Designing” she thoughtfully replied, “that, and the antiques”. While Gracie carries an impressive selection of their vintage motif papers, the more modern designs are just as delightful. Jenn’s passion for the design process has gone hand in hand with her love of antiquing, and she’s even drawn inspiration from some of the vintage treasures to incorporate in the Gracie portfolio. Her favorite example of this was an antique porcelain piece featuring Koi fish, which are featured in one of their most striking designs. Jennifer also shared with me a few of the interesting projects that have really stood out during her career. Among these favorites was a design that has a history older than the company itself. In 1925 the publishing giant Condé Nast bought a fabulous 30 room Penthouse on Park Avenue, and hired Elsie De Wolf to outfit the lavish space. 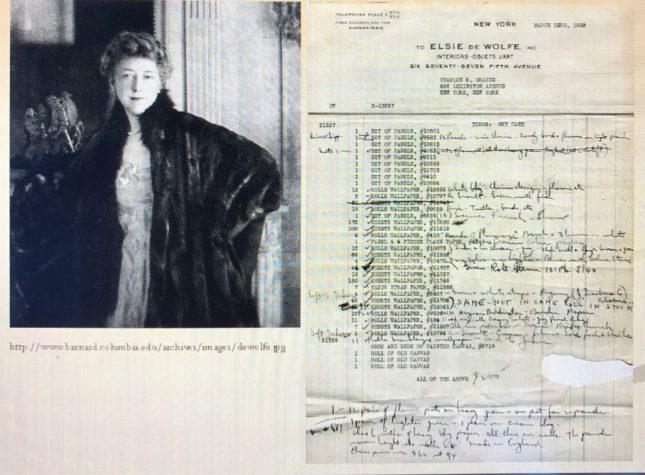 Besides being a prominent figure in New York, Paris, and London society, De Wolfe is widely regarded as the first professional interior designer. She led these renovations during the height of Nast’s success, and his home became the setting for the most extravagant parties of the era. 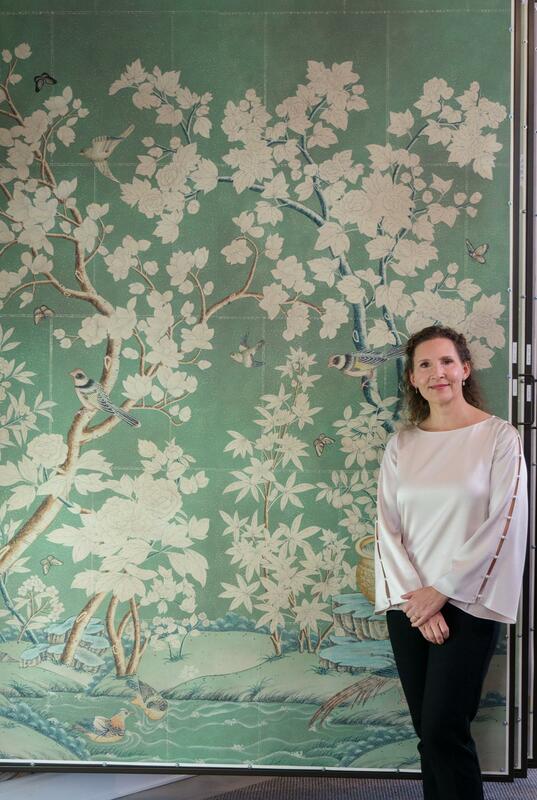 For the ball room, Elsie chose a gorgeous hand-painted Chinese wallpaper that was unlike anything else seen since. The stunning motif transported you to a secret garden, and set the stage for gatherings where society elite mingled with the greatest actors, musicians, and artists of the time. The paper was originally created in the 18th century, and had adorned the walls of an opulent English country home before being acquired by De Wolfe. 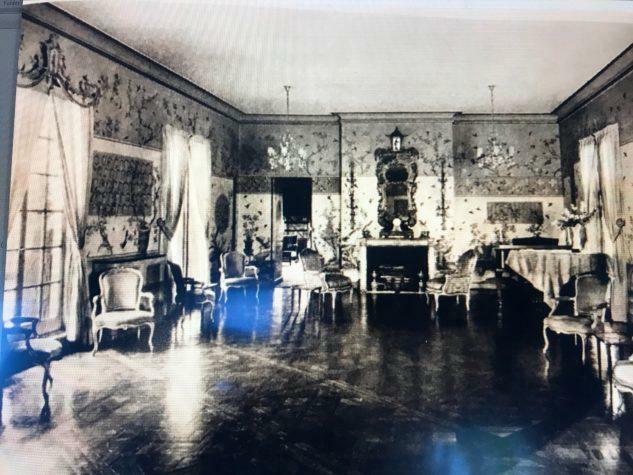 Unfortunately, like most industries, the publishing world was shaken by the Great Depression, so shortly after Condé Nast’s death in 1942, his beloved home was emptied and put up for sale. 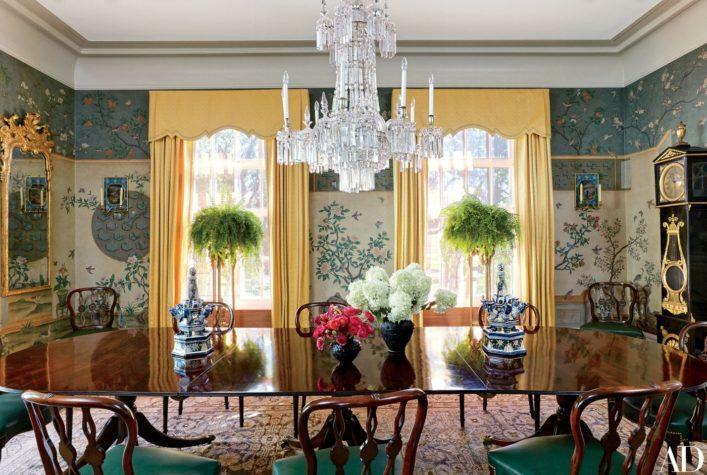 In 2013, Michael S. Smith–a prominent designer–had come across photos of this very wallpaper and fell in love with the unique design. When renovating his new Manhattan apartment, Mr. Smith looked high and low to see if he could track down the original pattern. After his search came up empty, he approached Gracie about producing a replica of the design. Much to his delight, they were able to do him one better. 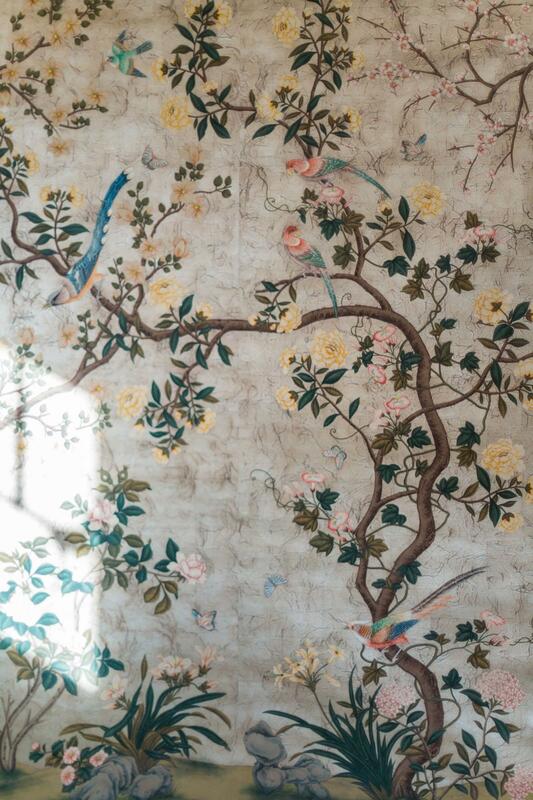 It just so happened that Gracie had been hired in 1943 to dismantle the original wallpaper in Conde Nast’s apartment. Nearly 70 years later, they discovered a few remaining panels which were still preserved in storage. Just enough to cover a small space, these panels are now the show stopping feature of Michael Smith’s cozy dining space. A fabulous example of timeless design finding its way back to the modern age. Gracie remains a leader in its industry, providing custom designs and a timeless catalog for those with exquisite taste. Their papers are in the homes of countless celebrities like Jennifer Aniston and Cameron Diaz, and are well recognized by interior taste makers like Architectural Digest. But that’s not what makes Gracie’s wallpapers so special. Gracie wallpapers are truly one-of-a-kind. 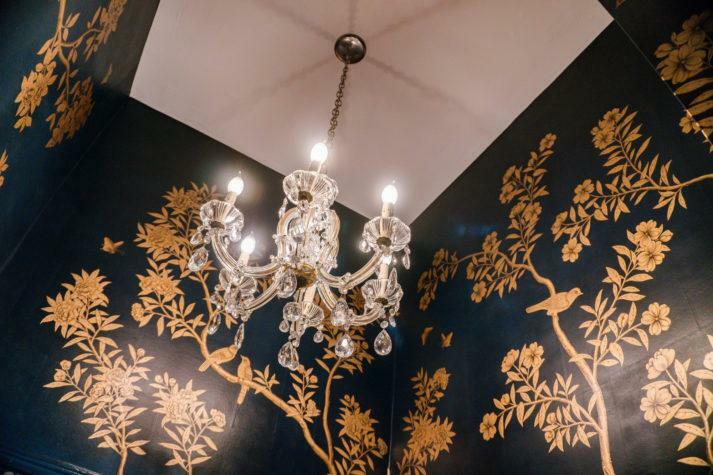 They are wall coverings, sure, yet they are exquisite pieces that almost transport you to another time period. From the subtle wrinkling of rice paper producing an aged effect, to the glazes creating a literal vintage patina, everything is exactly the way the client wills it to be. 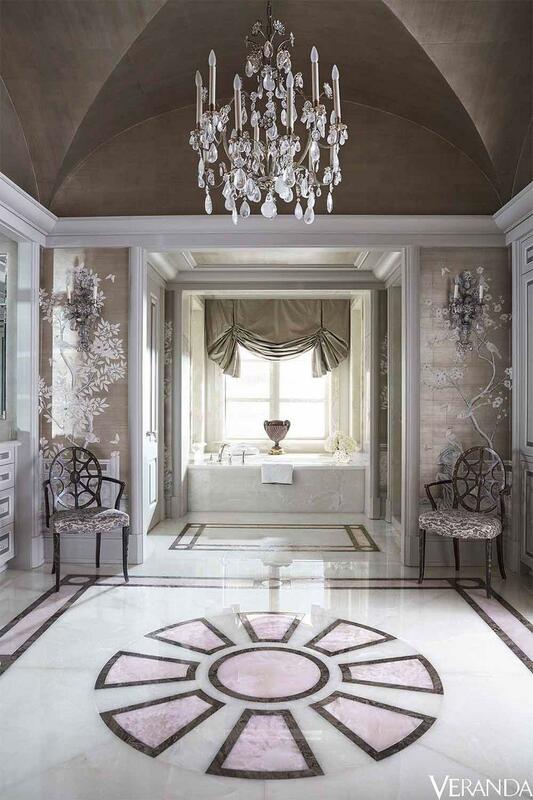 Their use of time honored materials like silk and metal leaf, really lend themselves to these captivating designs. It’s not an overstatement to say that when you’re surrounded by Gracie papers, you are living within a piece of art. Jennifer shared another example of a custom piece she’d worked on, where her clients sent her over 20 images of vintage Chinese porcelain to be replicated on their Gracie Paper. “They have a uniquely high chair rail, and each vase looks like it is perched across the top”. The artisans who bring to life Gracie papers have backgrounds in fine arts, and whether it be custom order or classic motif, their expert attention to detail shines through every piece. Even the installation process of the wallpaper itself is beautifully mesmerizing, one gets the sense that history is being created with each panel that goes up. Gracie papers are so alluring from their gorgeous Instagram feed, but nothing compares to an in-person view. While their flagship store is still located in Manhattan, they’ve recently put down roots on the west coast. Their new Melrose Avenue showroom is located in the heart of the LA design district, just across from the Pacific Design Center. The store front features the most inviting facade, known to lures in curious passersby in search of the perfect photo opt. Their new gallery features a generous display of their timeless designs, custom creations, and exquisite Asian antiquities. 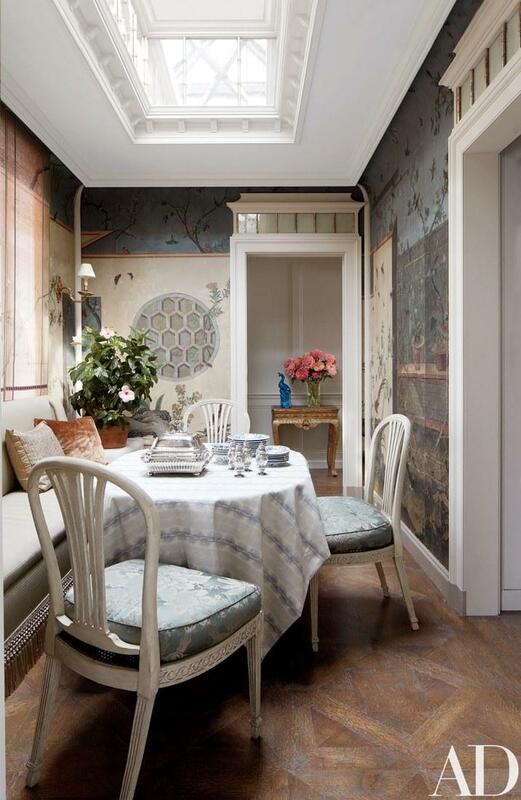 Gracie hand-painted wallpapers are a vision in many unique entryways, but the majority of their designs become the pièce de résistance of impressive dining rooms and luxurious bathrooms. “I have been waiting for this day” is Jennifer’s favorite thing to hear from clients when they’re placing their Gracie order. Similar to the way others must feel about finally owning their dream car, those who hold design near to their hearts, are hitting a major milestone when they choose their Gracie paper. “I never take it for granted that this is something special” Jennifer shared. “Even though I am around it everyday that I go to work, I never forget that this is something so unique, a lot of thought goes into it, and hopefully they’re going to love forever ”. 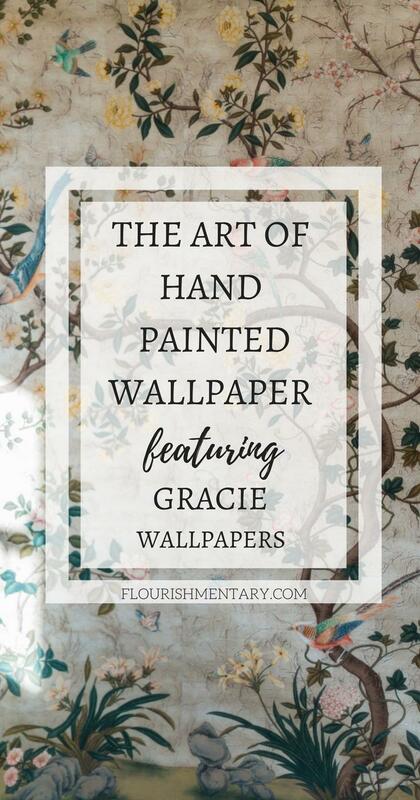 This sentiment resonated with me so much: since I laid eyes on their wallpapers, I’ve been looking forward to the day that I’ll be watching Gracie panels go up in my own home. If you’re on Instagram, check out the Gracie page, where they’ve got a gallery of fabulous rooms featuring their work. Jennifer runs their Instagram account @graciestudio, and—for all my fellow maximalists—it’s eye candy at its finest. You can also learn more about Gracie by visiting their website graciestudio.com. A special thank you to Jennifer Gracie, and the Gracie team for sharing their fascinating story!